Fueled by a 127 percent surged in worldwide sales, Android tablets collectively overtook the iPad last year, research firm Gartner said Monday. 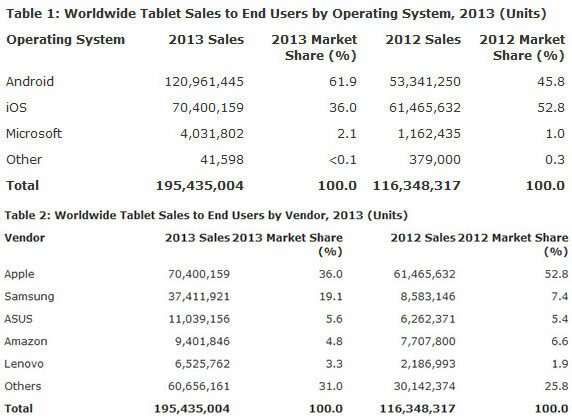 Android tablet sales jumped to 120.9 million in 2013 to snag a global market share of 61.9 percent, up from sales of 53.3 million and a 45.8 percent share in 2012. Over the same time, iPad sales grew to 70.4 million from 61.4 million. But Apple’s share of the tablet market dropped to 36 percent from 52.8 percent. Apple’s slice of the market fell amid increased demand for smaller, low-cost, name-brand tablets and cheap “white-box” products from off-brand manufacturers in emerging regions, Gartner said. Tablet sales for the whole industry grew by 145 percent across emerging markets compared with 31 percent in mature markets. “In 2013, tablets became a mainstream phenomenon, with a vast choice of Android-based tablets being within the budget of mainstream consumers while still offering adequate specifications,” Gartner research director Roberta Cozza said in a statement. Apple hung onto its spot as the top tablet maker, leaving Samsung in second place with 37.4 million in sales and a market share of 19.1 percent. But Samsung was on fire last year compared with 2012 when it sold just 8.5 million tablets and eked out a 7.4 percent share. Overall tablet sales hit 195.4 million in 2013, a 68 percent increase from 2012.